When you want to treat yourself to a real luxury fabric alpaca should be at the top of your list. Warm, light and hypoallergenic, it also looks great and feels soft and sensuous. Once it was so highly valued that only Inca royalty were allowed to wear it, but now it's widely available in a range of delightful garments. 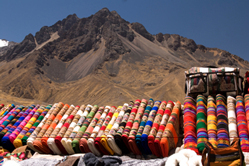 Alpaca fiber is a 100% natural material that takes its name from its source. The alpaca is a domesticated animal from South America that looks quite like a small llama. Alpacas stand about three feet high at the shoulder and weigh up to 180 pounds, and live in small herds. They've been bred in South America for thousands of years and have a valued place in culture and mythology. There are two types of alpaca, noted for the difference in their fleece. Huacaya alpacas have a dense, crimped coat like soft sheep's wool, while Suri have longer silky locks. Most of the fleece is white but in total there are 22 natural colors; white alpaca can also be dyed, and will take on deep, rich colors. An alpaca is sheared once a year and the finest, softest fiber comes from younger animals. Textile fragments over 2,000 years old have been found in ancient burial grounds in Peru, and they contain what archaeologists believe is alpaca fiber. Even today some of these cloths have amazingly vivid colors. Alpaca fabric was known as the "fiber of the gods" and cloth made from Suri alpaca was reserved for the use of royalty and priests. In the 19th century alpaca cloth was refined in the mills of Bradford, England, and it began to gain popularity throughout the world. Now it's available in more weaves, colors and garments than ever before. Once sheared and processed, alpaca fiber is amazingly versatile. It can be spun or woven into soft yarns or light, silky cloths. Huacaya, with its crimped fleece, makes for a naturally springy yarn that's ideal for knitting or crochet. Suri's straighter fibers are perfect for weaving. Either way, though, the end product is great. Anything that can be done with sheep's wool can be done with alpaca too, but it's superior in many ways. Unlike wool it's not prickly, so it rests comfortably against sensitive skin. It also contains no lanolin, which makes it naturally non-allergenic. It's softer and warmer, too. The characteristics of alpaca depend on how it's spun; although it's naturally light heavier, dense fabrics can also be made from it if you want, so it's suitable for almost any purpose. Alpaca yarn makes soft scarves, gloves and hats that are ideal for a cold winter day, or it can be knitted into light but luxurious blankets and throws. Alpaca cloth can even be turned into dress suits. 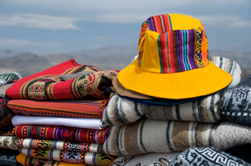 Of course alpaca is also popular among outdoor enthusiasts, who love its warmth and comfort. It's very durable, too. Garments of all sorts are available in a huge range of fibers, both traditional and modern. If you want something special, though, alpaca is just what you're looking for. It's attractive and practical, and by choosing hand-made alpaca you'll also be supporting small businesses. Our article Creating Clothing from Alpaca Fiber outlines the various steps of how clothing is made from Alpaca Fiber and Fleece.